When it comes to food, nothing says “special occasion” or “holiday”, like a perfectly seasoned, succulent prime rib, stuffed with garlic. Savory, tender and juicy, it’s the perfect pick when there is a desire to share something truly divine with loved ones. The marvelous thing about a culinary “splurge” is that it’s a rarity, and that makes it that much more appealing and unforgettable when deliciously prepared. From the purchase of it, to the preparation of it, to finally sitting down at the table to deliberately enjoy it, there’s much love that goes into the process; and all of that equals that much more depth of pleasure, that much more richness of flavor and complexity of character, than if it was just “another” meal. True, prime rib is a choice a bit more on the pricey side; but as it’s something that in our house we eat only once a year, on Christmas Eve, it’s well worth it. As it sears, sizzles, browns and roasts in the oven, the aroma permeates the entire house—it offers a fragrant preview of what awaits us in just a couple of hours time, and creates a toasty warmth as the set-up of the dinner table begins. There’s a joy and feeling of gratitude that accompanies our whole dinner experience when it’s a part of our special holiday menu. The flavor of a holiday splurge should never be taken for granted; rather, it should be fully luxuriated in, fully enjoyed and fully acknowledged for the gift that it is. If a prime rib roast was something that was eaten on a regular basis, it most definitely wouldn’t have that magical “specialness” that it indeed has for my family; it would be like any other tasty meal. But no, our once-a-year little festive dinner, our special, celebratory holiday meal—complete with candles, some good wine, stimulating conversation, reflection and hopes for the upcoming year—becomes a very conscious and meaningful splurge; one that we won’t taste again until next year, God willing, and that’s perfectly fine with us. 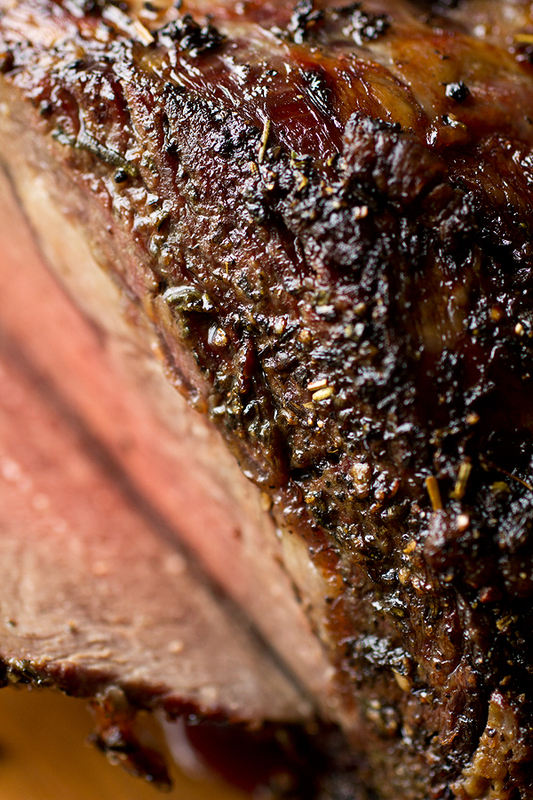 Prime rib doesn’t have to be one those things you only get at a fancy restaurant. It’s actually quite easy to prepare when you know what to do; and it feels utterly amazing to be able to pull it off, especially when you see those smiles across the table; and perhaps even do it better than those “fancy-schmancy” places! Create a rub for the roast by combining olive oil, sea salt and freshly cracked pepper (it should be enough to cover the entire prime rib). For my recipe below, I also use fresh garlic, rosemary, thyme, parsley, Italian seasoning, and dijon mustard. 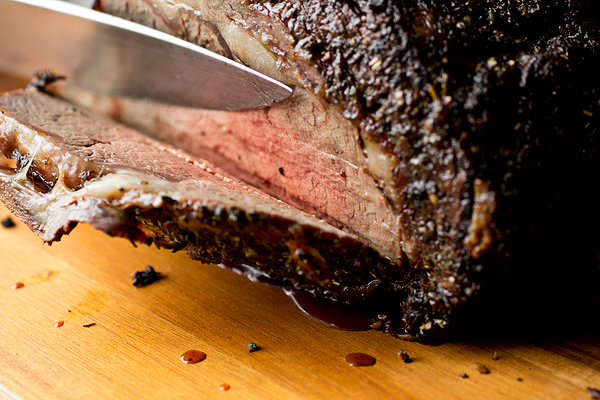 Rub the seasoning mixture all over your prime rib, covering it completely. Place the roast with the fat-side up and rib-side down onto the baking sheet, and load it into the oven. Let it cook for 45 minutes at 425 degrees, then you’ll want to reduce the heat to 375 degrees, and continue for another 30 minutes. Then, you’ll cover the roast lightly with foil, and allow it to cook for an additional 30 minutes (approx.). I highly recommend using a digital thermometer, and it should be inserted into the center of the roast. When the temperature registers 135 degrees, it’s medium rare; 145 degrees, it’s medium. And when your desired temp is reached, remove the roast from the oven, lightly cover it with foil, and make sure it rests for approximately 20 minutes before carving and serving. Have your butcher cut the bones, reserving them: I had the butcher cut the bones off of my prime rib, and reserve them for me; I seasoned my roast and placed it back on top of the detached ribs, and roasted them together. This creates a natural and flavorful “rack”, and makes for easier slicing of the meat once it’s roasted. Season the prime rib ahead of time: For extra bold flavor, I allowed my prime rib roast to sit, seasoned and stuffed with garlic, in the fridge for 48 hours before I planned to roast it; I simply placed the seasoned roast with its bones onto a platter and into a jumbo-sized ziplock bag, and removed it from the fridge an hour before roasting. For best results, use a digital thermometer This is a special (and expensive!) cut of meat and I recommend you definitely use a digital thermometer for perfect results. It’s best to insert the probe into the thickest part of the roast, and then keep an eye on it (or set the temp) to ensure proper internal temperature and doneness. I find that 135° gives a perfect medium-rare (nice and pink in the center), as pictured in the photos. 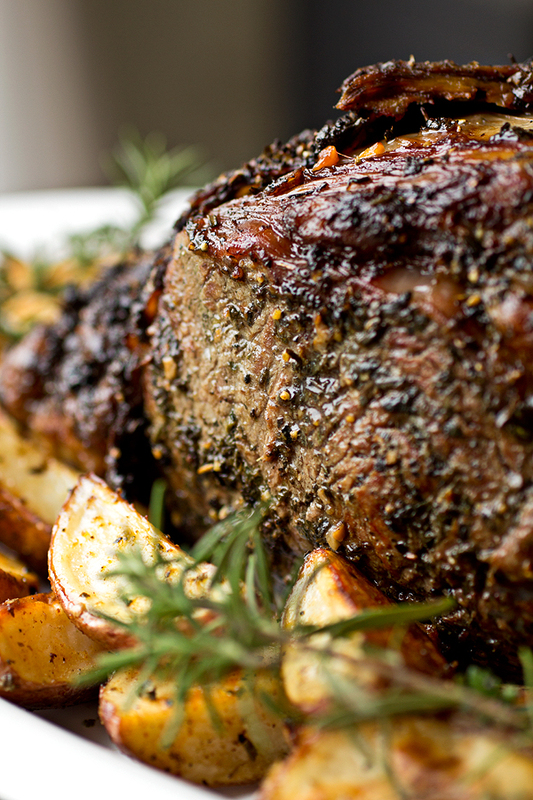 This succulent prime rib, stuffed with garlic and topped with a crispy herb crust, makes for an extra special holiday meal! • 1 (3-bone) Beef Prime Rib*, about 5-6 lbs. *I had the butcher cut the bones off of my prime rib, and reserve them for me; I seasoned my roast and placed it back on top of the detached ribs, and roasted them together. This makes for easier slicing of the meat once it’s roasted, and the ribs act as a natural and flavorful “rack” for the roast itself to sit on. -Preheat the oven to 425 degrees, and line a baking sheet with foil. -Make 8 small slits into the prime rib (4 on top and 4 on the bottom) about 1/2” – 1” deep; take two of the cloves of garlic, and quarter them creating 8 smaller pieces; stuff the pieces of garlic into the slits. -Next, take the remaining 2 cloves of garlic, press them through a garlic press and add them into a small bowl; add to this the chopped, fresh rosemary leaves and the remainder of the ingredients through the olive oil; with a fork, mix the ingredients until well combined, and rub this entire fragrant mixture all over the prime rib, covering it completely (at this point, if you had the butcher remove and reserve the ribs for you, you can now place the seasoned roast on top of the ribs). -Place the roast with its fat-side up and ribs down onto the baking sheet, and place the roast into the oven; cook for 45 minutes at 425 degrees, then reduce the heat to 375 degrees, and continue to cook for another 30 minutes at which point you will cover the roast lightly with foil, and allow it to continue to cook for an additional 30 minutes or so, or until a thermometer inserted into the center of the roast registers 135 degrees for medium rare, or 145 degrees medium. -Remove the roast from the oven, lightly tent with foil, and allow it to rest for about 20 minutes before carving the roast into roughly 1/2” thick pieces. Serve with the Creamy Dijon-Horseradish Sauce and Au jus on the side, if desired. -In a small bowl, combine all of the ingredients, and whisk together until smooth and well-combined; cover with plastic wrap and store in fridge if making ahead of time, or serve immediately. Cook’s Note: This post was originally published in 2012 and has been updated with even more love. Beautiful and so well said as always. It looks absolutely divine. And I couldn’t agree with you more…anticipation is the ingredient that takes a normal dish to an outstanding dish. Hi Courtney, thank you so much for your comment! All of your photos are just beautiful. this is my holiday splurge as well! very well written and it resonated with me and my feelings for prime rib! Hi Paul, thank YOU for sharing that; I hope you have a wonderful holiday season, and that you indeed enjoy every bite of your tasty splurge just as much as we do! Thanks for the wonderful imagery…it was your talented descriptions that drew me further into the website. Thanks so much. I will be putting this to task on Christmas day and look forward to following your advice. Hi David, I truly appreciate your kind words – thank you! I’m excited that you will be trying out the recipe, and hope you enjoy preparing this as much as I did! Bon appetite, and Merry Christmas to you and yours! Yum! This is in the oven right now. It smells fantastic. I can’t wait to have this for our Christmas Eve dinner. Thanks for the beautiful photos. They inspire me! Happy holidays! Hi Joanne! My deepest hope is that this turns out wonderful for you and your family – please enjoy, and have a very Merry Christmas! Got a rib roast in the oven now. The aroma has made its way through the house. The roast is looking amazing with the rapidly crisping garlic and seasonings all over it. I’m sure it will be great. Thanks for the write up. Merry Christmas! It sounds like things are cooking up perfectly! Thanks for coming by to comment Aaron, and have a Merry Christmas as well! I’ll be doing this for my family this coming Christmas and am very excited about making it. Your sides pictured look very good with the prime rib. Do you have those recipes as well? Hi Heather, I was so excited to read that you plan on preparing this delicious roast for family Christmas dinner this year – that’s great! 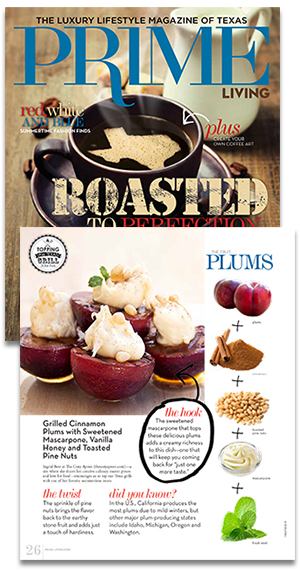 And here are the links for the sides, as well – a simple recipe for roasted potatoes is found at the bottom of this page: https://thecozyapron.com/a-cozy-stew-spicy-tequila-lime-pork-stew-a-spirited-south-of-the-border-meal/ And the Cider-Glazed Brussels Sprouts: https://thecozyapron.com/a-cozy-holiday-cider-glazed-brussels-sprouts-with-crisp-pancetta-the-perfect-emerald-companions/ Enjoy! Hi Donna! You know, I don’t have experience with an electric roaster, so in all honesty, I hesitate just a little to tell you one way or another since this cut of meat is pretty pricy to have it not turn out. I would say that if you’ve had success roasting in it previously, and if it can reach the required temperature needed for the recipe, then it’s certainly worth trying. Hope you enjoy! Are there any other cuts of meat that can be used in place of Prime Rib? Hi Boa, you can certainly roast other cuts of meat; but this recipe and the instructions are specific to prime rib roast, so substituting another cut of meat for this one would yield different results. Hope you give this one a try, though! This was abso-freaking delicious. I made it just as directed, let the roast marinate in the garlic and herbs for 2 days, cooked as directed with one exception, I had a 2 rib, 5lb roast and cooked it 15 minutes less than directed. Absolute perfection. My husband and father in law were making purring sounds. I’m an excellent cook, I don’t have a blog but cooking is “my thing” and I give this recipe 5 stars…it was really delicious. Thanks for the recipe…glad I chose this one this year…the search for the perfect prime rib has ended. Sherry, I’m so thrilled to read that your search for the perfect prime rib has ended – thanks so very much for taking the time, on Christmas, to come and share your experience preparing this recipe! I was very tickled to read that your father-in-law and husband thoroughly enjoyed this so much, too. 🙂 Thank you for the 5 star review – I appreciate it! Ingrid I must tell you that I made this prime rib for Christmas yesterday and it was a GIANT HIT!!! Thank you so, so much for this wonderful recipe. I have never made prime rib before but it came out perfect, was the hit of the dinner and I was told by my step father, who always makes the meat course, that I am in charge of making prime rib in our house from now on. Thank you so much for making my Christmas dinner night perfect!! Raven, forgive me for sounding totally corny, but you’ve made my heart leap with your comment! I’m so happy that you had a great experience with prime rib on your first time attempt – yeay! And what better a thing than to be told be your step father that you’re officially now in charge of this dish from now on. Thank you for letting me know that this turned out so well for you – I always hope that folks will enjoy something in their home that my family and I enjoy in ours! Made this for Christmas dinner and it was a hit. Husband suggested that this be our new tradition. Thank you so much. Made this for my husband tonight. Did it EXACTLY like you suggested (except I didn’t use 1/2 cup of oil in the rub and ended up with very little drippings for the Au Jus…hmmm/but still tasted good!) * The beef turned out AMAZING. Thank you!!! HI Chantelle, I’m so excited to read that you and your hubby enjoyed this! It’s a bit of a pricey cut of meat, but when prepared right, there’s nothing like it. Thanks so much for coming back to share your experience with the recipe with me! I plan on making only a 4lb roast. How would you adjust the cooking time to get exactly how you show above? Thanks so much! Hi Andrea! I like to give time frames as a general guideline for how long something takes to cook, but in this case, I would absolutely use a (digital) meat thermometer inserted into the thickest part of the meat to ensure a perfectly cooked roast. You can cook as directed, but you’ll obviously not go quite as long. If you use the thermometer, you don’t have to worry about time so much; you’ll just pull the roast out when it reads 135° for medium rare. I’ve been seeing Rib Roast on a lot of people’s Christmas menus. I’m seriously considering this as the star of the table. 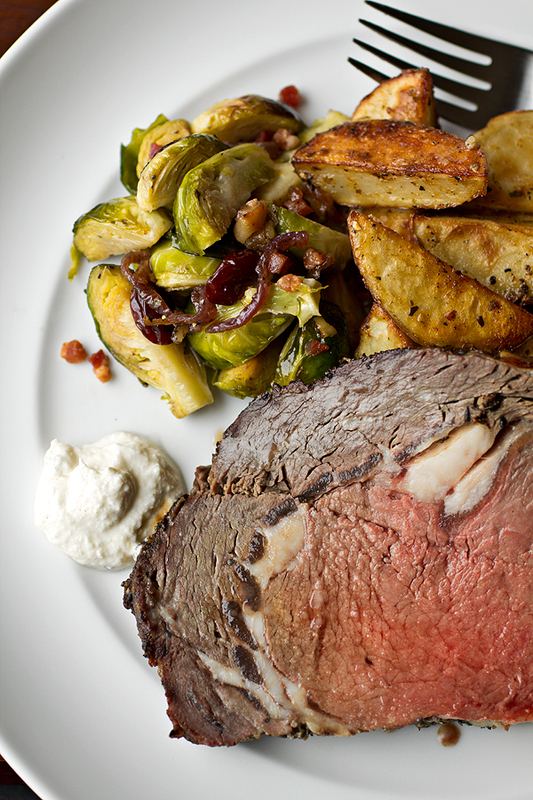 The picture and simplicity of this recipe just sold me on making a Rib Roast this Christmas. I certainly hope it comes out as beautiful and perfect as yours. You are truly an expert. Inna, that is so kind of you to say! I’m certain that it will, just follow my recipe and be sure to pay most attention to the inner temperature of the roast for the perfect medium-rare (135°), more so than the length of time. (The internal temp is the only true way to know how the roast will look on the inside!) Best wishes to you on this recipe, and I hope you all enjoy!! Made this last night for a dinner party. Mine was 7 pounds and took a little shy of 3 hours to cook and it turned out perfect. Everyone loved it. I made the horseradish sauce too with extra hot horseradish and the 3 of us that love hot food ate it up! Thanks so much! What a big, beautiful roast you made, Erica! So glad you enjoyed the horseradish, too! 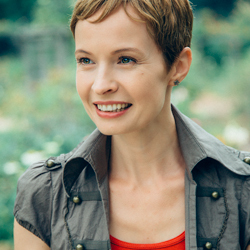 Thanks so much for sharing your experience with me. I made this for the first time for Christmas dinner and everyone loved it! I only made a 4 lb one and used rosemary olive oil instead because my local grocery store ran out of the fresh kind and it still turned out great. I’ve never made this cut of meat before and I’m new to cooking and everyone seemed impressed. Thanks for a great recipe! It has definitely helped me build up my reputation as a new cook in the family. Rhea, nothing makes me happier than to read that a “newer” cook has a great experience with a recipe of mine! So thrilled that this turned out so well for you, and that you and your family enjoyed it. Thank you so much for sharing that with me! 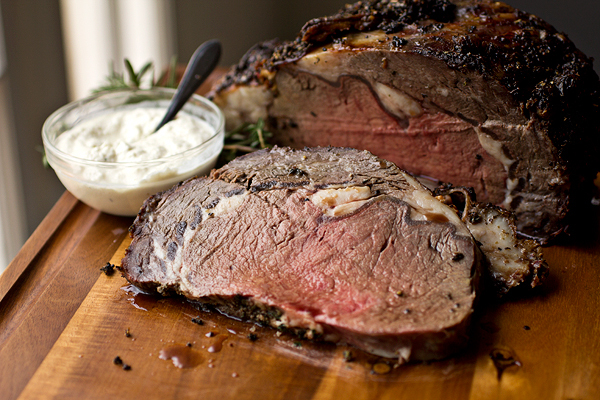 We cooked a prime rib roast, following your recipe closely, and it turned out BEAUTIFULLY!! This recipe is a keeper – thank you! Scored rave reviews from all our dinner guests. Andrea, that is really wonderful! So glad you shared your experience with me, and that you all enjoyed this! Thank you for your comments. Hi Debbie, nothing too complicated! 😉 You could use a cabernet sauvignon—nothing too expensive, but something you would also drink with it. This recipe sounds wonderful! I plan on making this for our Christmas dinner this year. Kimberly, I’m so very excited for you! Hope you enjoy, and may you and your family have a wonderful Christmas dinner! I’m honored to have my recipe be a part of it. Hello, when do I add the potatoes and brussel sprouts in order to cook with roast? Hi Doug, how incredibly creative! I’m so happy it turned out so well for you, and that you and your family enjoyed it; and I’m sure it had an interesting “twist” in flavor seeing as you cooked it on the BBQ! I leave bones attached to roast, and cut them off myself after cooking. I also have market layer about a quarter inch thick piece of fat on top of roast, and tie it on. The fat melts,and helps baste meat, and makes it tasty!